A normal part of the human body's standard aging process involves the slowing of elastin and collagen production in your epidermis. The result is much more visible wrinkles, lines, and creases, in addition to loose skin around the chin, neck, and jowls. To fight these signs of aging, Couture Dermatology & Plastic Surgery provides FaceTite. This premier nonsurgical procedure, advocated by board-certified plastic surgeon Dr. Marvin Spann and board-certified dermatologist Dr. Candace Spann, uses radiofrequency-assisted lipolysis (RFAL) to melt and dislodge fat cells, causing your skin to firm and allowing collagen to be created at a much quicker rate. You can receive a smoother, more youthful facial appearance which presents with fewer wrinkles without the invasiveness, large scars, and recovery period of surgical lifting operations. We invite you to schedule an appointment in our office in Las Vegas, NV to find out more about FaceTite and its amazing advantages. FaceTite uses RFAL (radiofrequency-assisted lipolysis) technology to melt fat and tighten skin. This allows you to attain results comparable to a surgical facelift or neck lift in a single, minimally invasive procedure. Compared to a surgical procedure, FaceTite uses smaller incisions and has a shorter recovery time with reduced swelling and discomfort. 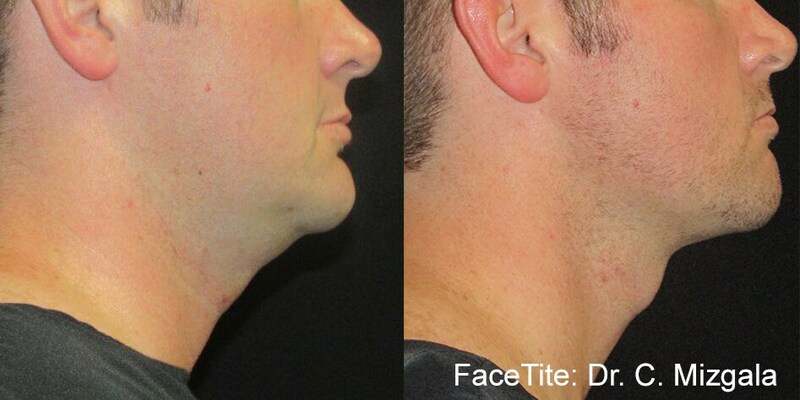 FaceTite is also popular for providing impressive results that still look natural and last a long time. FaceTite is a great solution for individuals who want a result comparable to a surgical facelift or neck lift without an invasive surgery, large scars, and extensive downtime. Almost anyone who wants to look their best and has concerns about sagging skin in the neck and facial areas should consider FaceTite. Since your face and your needs are unique, we will design a treatment plan specifically for you. Your plan may include other services to assist you in achieving optimal correction. FaceTite is performed in our office as an outpatient procedure in about two hours. Depending on what area(s) you are having treated, this time may vary and you will be given a more exact time estimate during your consultation. Once the treatment area(s) has been numbed with a local anesthetic, a tiny cannula will be slipped underneath your skin. The FaceTite device utilizes radiofrequency power to disrupt fat cells and cause the skin to contract while creating an increase in natural collagen production. After a FaceTite procedure, you will be asked to return home to rest for the remainder of the day wearing a sculpting (compression) garment. You will be instructed to wear your sculpting garment 12 - 24 hours a day for up to 10 days. You should be able to return to your daily routine by the next day. It could take around 3 - 4 days for any redness or swelling to subside. Strenuous activities and exercises should still be avoided for approximately 1 – 2 weeks following the procedure. Remember, you will see results immediately, and your skin and contours will continue to tighten and reshape over the next few months. The sculpting garment helps this process. You will see results immediately. You will have a firmer contour and smoother skin right away, and your skin will continue to tighten and reshape, with optimal results achieved at 4 - 6 months. A FaceTite treatment will take about 2 – 4 hours, depending on which area(s) you are having addressed. During your consultation, we will give a better estimate of your treatment time based on your personalized plan. Most patients only need one FaceTite session to get their best results. During your consultation, we will listen to your concerns and goals before creating your FaceTite treatment plan. We may suggest combining FaceTite with liposuction or a nonsurgical treatment to achieve your aesthetic goals.